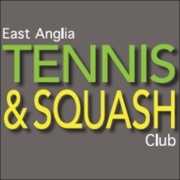 The East of England Masters was played at the very hospitable East Anglia Tennis and Squash Club in Norwich from 14-16th December 2018. The chance to avoid Christmas shopping obviously appealed to many and there were some strong and competitive draws. That being said, one of the problems our very successful organisation has is the participation of Women players. This is a game wide issue and one we must try to improve upon. Having said that, some of the best women players in the country were there. In the 55s Derbyshire's Lesley Sturgess overcame Avon's Pippa Green in four tight games and National Champion Rachel Woolford took the over 50s title again beating Kay Fallows in the final. Late withdrawals spoilt the 45s somewhat, but former World ranked pro Sarah Spacey of Hampshire showed off her silky skills to take a second title of the season. Sarah Parr was second. In the 35/40s Kent's Keeley Johnson has won National, British Open and European titles and she was too strong here in spite of a determined effort by Surrey's Vix Smith, winning 3/1. In the absence of some regular winners, the Men's over 70s was fairly open but Larry Grover of Guernsey proved too solid for the lively Yorkshire Chairman Mike Clemson. British Open Champion Ian Holmes of Northants took the Men's O-65 title in a close five game match against Cumbria's Terry Belshaw - his ninth Regional win. Jeremy Goulding of Avon is the outstanding player in the UK in the Men's 60s. Having come into the group he won the British Open and this was his second Regional title of the season. Gordon McManus in the semis and Ian Bradburn in the final had no answer to his pace and mobility. Darren Withey of Buckinghamshire will be tired. Three five game matches, four played,a great revenge win over Middlesex star Alex Betts and finally a five game loss against the quality of Eamonn Price of Hertfordshire. His fourteenth Regional title. Two regular sparring partners met in the 50s final with Norfolk star David Youngs, the National Champion in the ascendancy. Hampshire's Steve McLoughlin had other ideas, however, and with some stunning retrieving crafted out a tight 3/0 win. Paul Boyle of Buckinghamshire is having a good season and another final here against England team mate Ashley Bowling of Oxfordshire was a thriller. Boyle went two up but was pegged back after Bowling won a tense third. The fifth could have gone either way but Boyle got a couple of points ahead and stayed there for his second triumph of the season. The 40s was a contest of the two MMs with Matt Marshall of Bucks taking on Middlesex's Mike McLaughlin. Marshall was sometimes sublime, and sometimes not, but McLaughlin, strong and steady weathered the storms and ran out a deserved winner in five. The men's 35s had a number of stories. The cracking semi final between Alex Preston and Alistair Coker going to 16/14 in the fifth was but one. But the most remarkable thing, possibly in the entire Masters circuit, when five years age groups are paramount, is how does a 47yr old player keep winning the Men's over 35s against the best players in the country? Norfolk's Jamie Goodrich just keeps on delivering! Against Preston, a former British Open winner, he carefully crafted another fine victory - his 21st Regional title, all in the over 35 age group. That's a record and he is third in the overall list. Thanks go to the Club and Manager Alasdair Peat and all his staff, the referees, Mike Campbell, Robert Thirst and Peter Berry, and of course, our very own Event Managers, Brian and Roz Brock who make the difficult look simple.